Artist Elaine Lanoue in her own words,"This art is a companion piece to Textured Conceptual Movement #2 and is wonderfully textured with repurposed acrylic paints." When people speak of the most noteworthy and talented artists today, Artist Elaine Rose Lanoue is always mentioned as one of the most famous living acrylic artists in the United Sates. Her incredible painting style can be described as contemporary semi-representational and abstract. Elaine’s love of diverse ethnicities and colorful landscapes form in her mind to inspire the highly textured and bursting colorful canvasses which she calls “happy” paintings. Her landscapes with the beautiful leaning houses are one of her trademarks, the long winding views of lakes, fields, mountains, vineyards, mist. sailboats, and towns are painted in her unique and wonderful style. When you view Elaine’s colorful figuratives, the emotion that she evokes through the warm facial expressions is remarkable. Her florals are painted in a unique fantastic abstract style with the surrounding backgrounds adding color, perspective, and dimension. 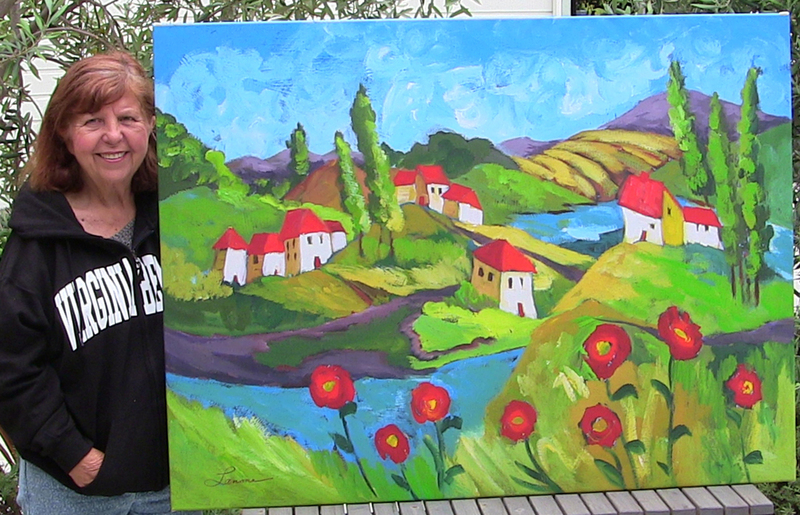 Many pieces of Elaine Lanoue’s artwork have been commissioned for several Houston hospitals, corporations, and banks. Her spectacular paintings have been commissioned and specified for the hotel industry by interior designers throughout the world. 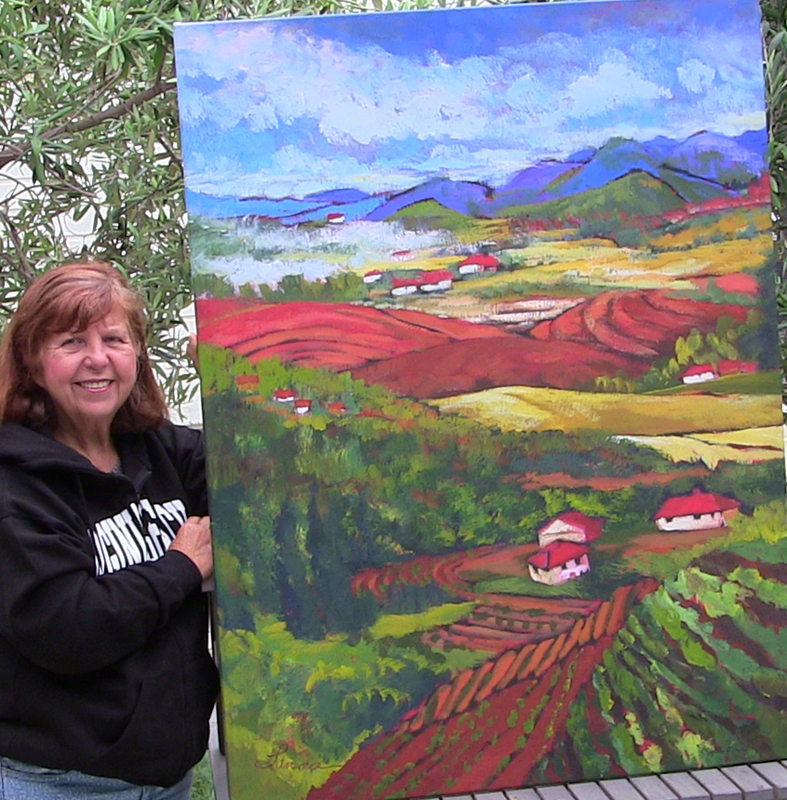 Since the mid 1990s Elaine and her husband have been exhibiting and selling their artwork at juried fine art festivals across the United States. The giclée prints are produced on high quality archival materials: Breathing Color Elegance Velvet Platinum Fine Art Paper - A 310gsm, bright white, fine art paper with a lightly textured vellum surface; a 100% cotton fiber paper offering a better color gamut and D-Max than any other velvet surface paper on the market. We offer 3/4" solid hardwood stretcher bars with back staple. Prints are on Breathing Color Chromata white , acid free, cotton-poly blend matte artist stretch canvas. All stretched prints are protected with a matte finish archival UV varnish. If you prefer semi gloss or gloss please let us know. If you prefer to have your giclée print framed and matted by our Gallery please let us know. We will provide you with a fair price and adjust the shipping charges to reflect the mat, frame, and glass. We would be pleased to perform this work for you. 1.) 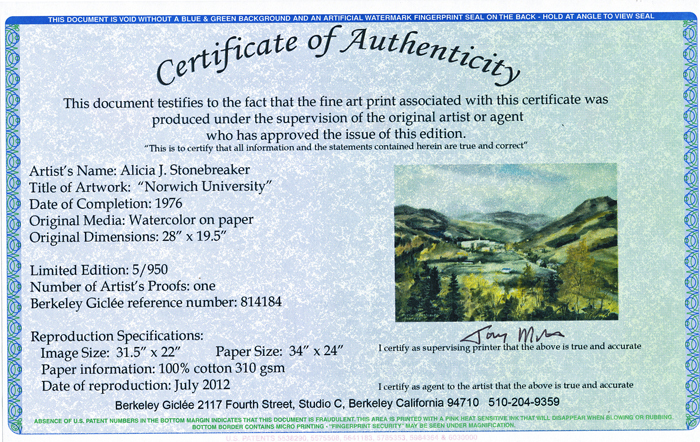 A secure certificate summarizing the details of the edition, the series number, and information on the original and the giclée reproduction. 2.) 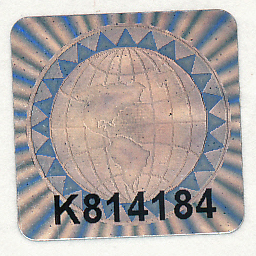 Holographic serial number affixed to the back of the giclée reproduction. This serial number will match the number printed on the actual Certificate of Authenticity. 3.) Berkeley Giclee, Berkeley, CA will independently monitor all “Limited Edition” sales through their Limited Edition Registry. “Open Edition” prints will be provided with a signed certificate specifying the type of archival paper and inks used in the giclée reproduction process.